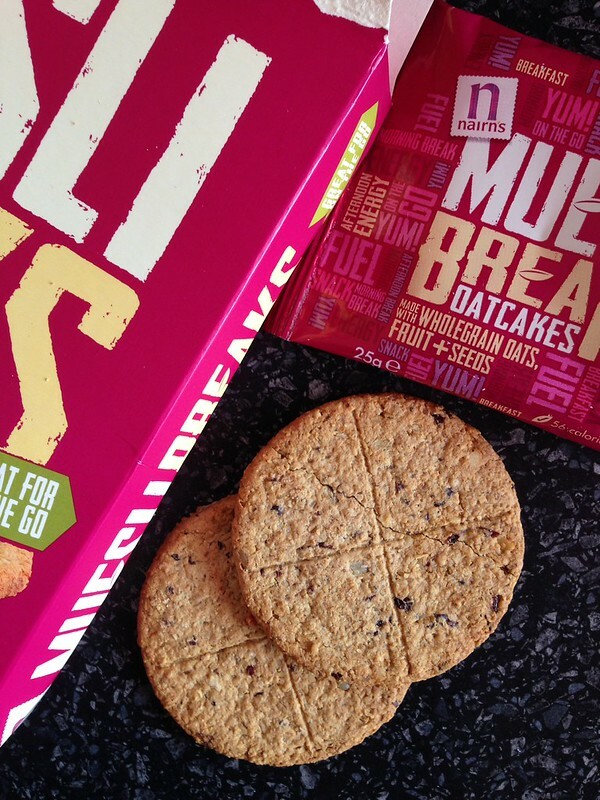 Nairns - known for their oaty treats - have a new snack out, called Muesli Breaks. They're wheat-free (but not gluten-free) and contain a mixture of oats, currants, sunflower seeds and pumpkin seeds. The oatcakes come in a box of 8 packets, each containing two oatcakes - so I can see that they would be good for packing in your bag and just having around should you get a snack attack somewhere. And, if you do, they're a good alternative to chocolate bars or other unhealthy things that tempt you while you're out and about - as they contain just 56 calories per oatcake. They taste sweet - you can detect the demerara sugar that gives the oatcake a lovely toffee flavour - and then little bursts of sweetness from the currants. The seeds remind you that you're doing your body some good, with the fibre and the slow-energy releasing oats, too. The lines across the oatcakes seem to be for decoration as they don't tend to break along them, should you want to snap one in half. But that's nothing really, is it? And they're quite sturdy and dippable - leading me to adopt a new oatcake and cuppa ritual before picking up the girls from school. Nairn's do a gluten-free oatcake, so - although I don't know how tricky it is to make - I think it's a bit of a shame they didn't just go the whole hog with these and make them gluten free as well. I know of some people that are intolerant to wheat, but there are a lot more who find gluten a problem. To find out more about these oatcakes visit the Nairn's website.